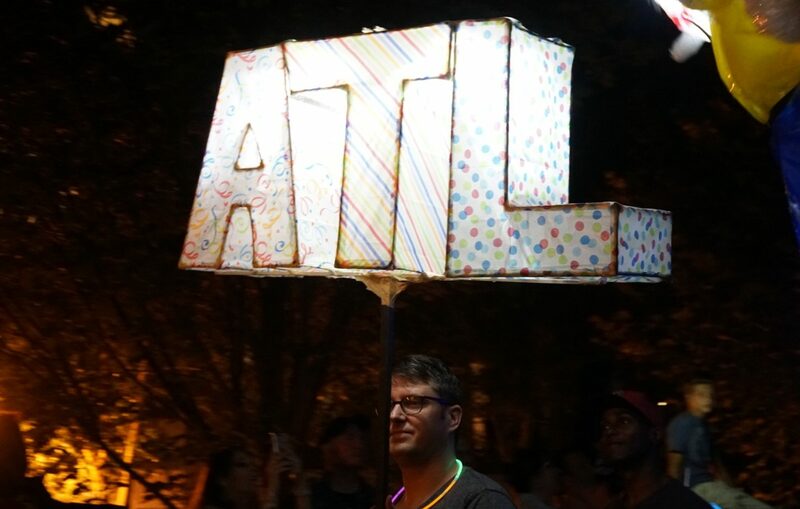 Atlanta’s BeltLine illuminated with color and ingenuity on Sept. 9, as thousands of people marched in the Lantern Parade with their homemade creations. 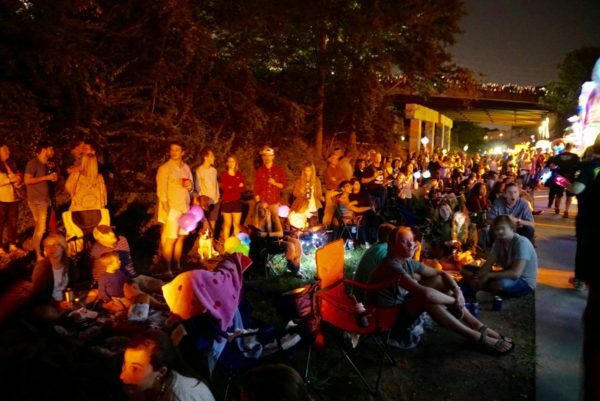 Hosted by The Krewe of the Grateful Gluttons, the Atlanta BeltLine Lantern Parade has been celebrated annually on the Saturday following Labor Day since its inception in 2010. “About two or three years ago, we came down to ride our bikes and happened upon the parade—it was a big surprise—and it’s really cool so we’ve been coming ever since,” Georgia State alumni David Haskins said. 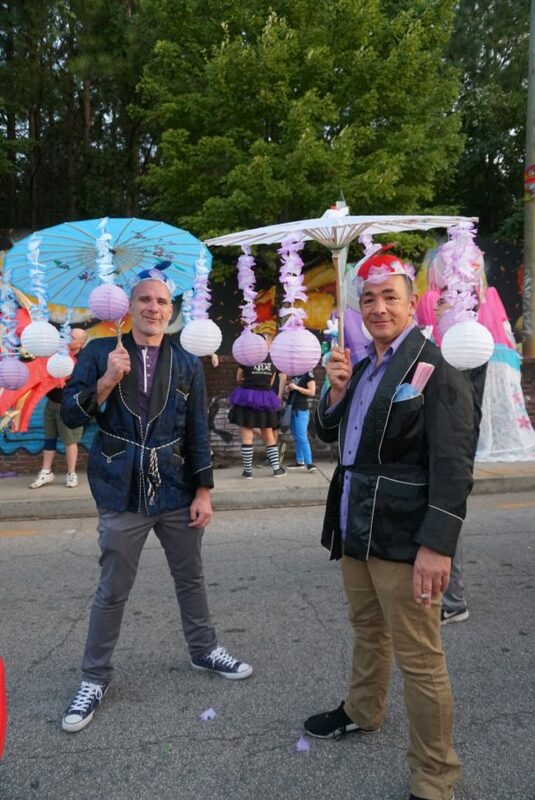 The Lantern Parade attracts residents from all over the Greater Atlanta Area. 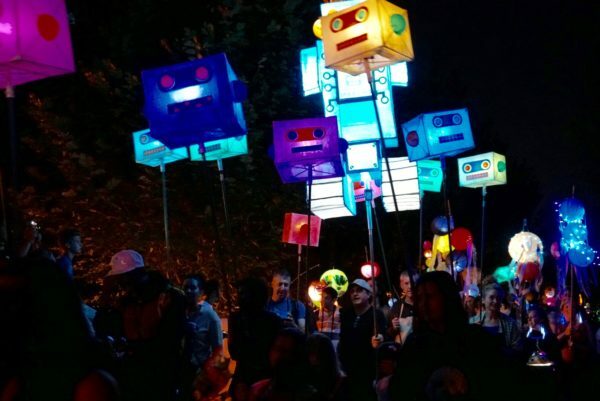 From modest handheld lanterns to giant interactive innovations, the celebration is an opportunity for people of all ages to have fun and get lit. The festivity kicks off the annual temporary exhibition known as Art on the BeltLine, which is the biggest of its kind here in the South. In its eighth year, the public exhibit embodies local artists as well as those from around the world. With many different artistic mediums, the event series is a platform for a wide variety of talent. While some people attend the parade to support this mission, others Atlantans go with their own mission. They go to support a cause or promote whatever it is they believe in, doing so in a unique and vibrant way. For example, many people that paraded along the trail held signs and wore t-shirts endorsing local government officials. Whereas these participants created lanterns for a specific purpose, others showed up purely to get in the spirit—using random household items to throw together last-minute lanterns. “My inspiration, quite frankly, was to do something very quickly,” Atlanta resident Tony Rushin said. Rushin laughed as he explained his lantern, which he decided to give an identity. 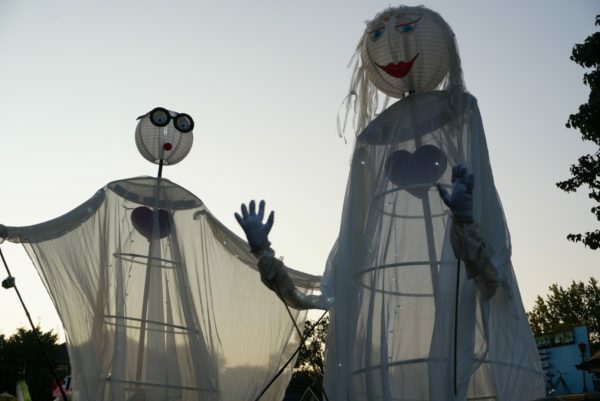 For those that need a bit of “lit-spo,” there are many lantern making workshops that lead up to parade day. Parade prodigy, Chantelle Rytter, teaches these helpful how-to classes and encourages people to create something special that can be proudly paraded. Lantern hats, giant glowing butterflies, illuminated parasols—Rytter and her Krewe foster “creative playtime” no matter what lantern workshop attendees choose. “What I love about it is that it’s good for all ages. It’s something families and friends can do together,” Hatcher said. While thousands of people enjoy marching in the parade, there are many that come simply for the show itself. Bridge overpasses that overlook the Atlanta BeltLine were packed with spectators watching as the lanterns floated by below them. Residents of apartments and houses in surrounding neighborhoods and along the path watched gleefully from the comfort of their own homes. People cheered from their balconies as they watched the parade make its way past. Talk about a front-row show! Those who wanted to beat traffic and get a parking spot in the crowded nearby neighborhoods—or a good sideline spot to watch the spectacle—got there very early on Saturday. Blankets and lawn chairs were scattered along the trail. Onlookers sipped on drinks and giggled with their children as they waited all day for the parade. Michaela Foronda from Lithonia, Georgia said that she and her friends arrived many hours before the Lantern Parade was set to begin. Foronda watched as hundreds of people filled in empty spaces around her, excited for the main event to begin. From emojis to unicorns, Foronda said that she was very impressed with what she saw. “I’m excited now that it’s getting dark,” Foronda said. Glowing spectacles of all shapes and sizes bob along streets and cities all over the world, at all different times during the year. These lantern parades have dated back over 2,000 years and have taken place in dozens of different countries from Asia to the UK and Australia. These parades are meant to be a celebration and a coming together of family and community. The first lantern festival known took place in China in the beginning of the Eastern Han Dynasty. The Emperor, Hanmingdi, was a big advocate of the Buddhism religion. It is said that monks would light lanterns in the temples to show their respect for Buddha on the fifteenth day of the first lunar month, so the Emperor ordered every single person to light lanterns on that evening as well. Each culture has their version of lantern festivals and parades and their own beliefs behind what it symbolizes to them. Some are celebrations of the end of a 15-day New Year holiday, some are to celebrate the birth of Buddha, some use lanterns to celebrate the kindness of a monk for St. Martin Day’s, or to celebrate the end of the rainy season. A majority of the symbolism behind the festivals is to light up the night sky, warding off bad luck and bringing good fortune. These festivals bring together families and loved ones to reign in goodness and joy. 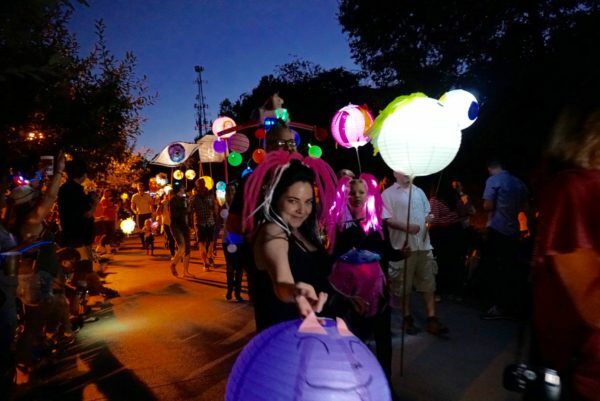 Regardless of the reason, each culture that participates in these various types of lantern festivals celebrate each year—and the Atlanta Beltline Lantern Festival is no exception. 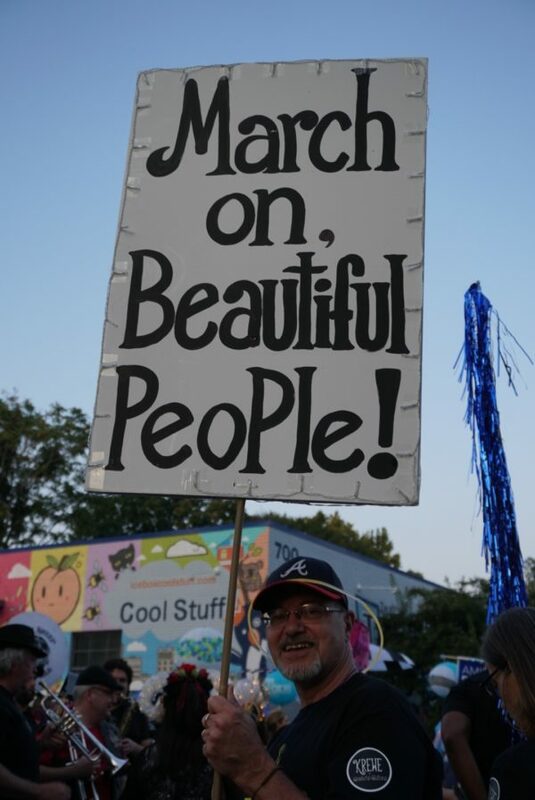 Our city’s parade continues to grow and become a place where people come together to celebrate the coming of fall season. You need a lantern to walk in the parade. No stopping. If you need to stop, please step off to the side. Please do not walk against the flow of the parade. Yield generous space to bands and large lanterns. Take your trash with you.